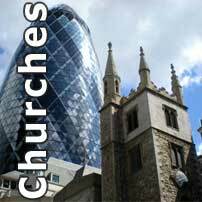 The Collegiate Church of St Peter, Westminster, is located immediately to the west of the Houses of Parliament and the River Thames in the City of Westminster. It contains the coronation throne which has been used for all monarchs since the fourteenth century and some parts of the structure date back to Edward the Confessor's abbey. It is still owned directly by the Royal Family, and this saw it spared from the ravages of the English Reformation. Traditionally, a shrine was first founded on the site in 616. At that time it was an area of dry land known as Thorney Island, which lay in the middle of marshes which were fed by the Thames. The land was said to have been miraculously consecrated after a fisherman on the Thames saw a vision of Saint Peter. Unfortunately, the existence of this shrine cannot be confirmed. There is no documentation which records it and the shrine was swept away for the abbey. Having been sidelined from political power by Earl Godwine, Edward the Confessor devoted himself to ecclesiastical works. Between 1045-1050 he oversaw the construction of a great abbey on Thorney Island which was consecrated on 28 December 1065. Its construction originated in his failure to keep a vow to go on a pilgrimage. Instead the Pope suggested that he redeem himself by building an abbey. Edward died just eight days after it was completed. The original abbey, built in the English Norman (European Romanesque) style, was designed to house Benedictine monks. It was rebuilt in the Gothic style between 1245-1517. The first phase of the rebuilding was organised by Henry III as a shrine to honour Edward the Confessor, who remained the patron saint of England until the fourteenth century. 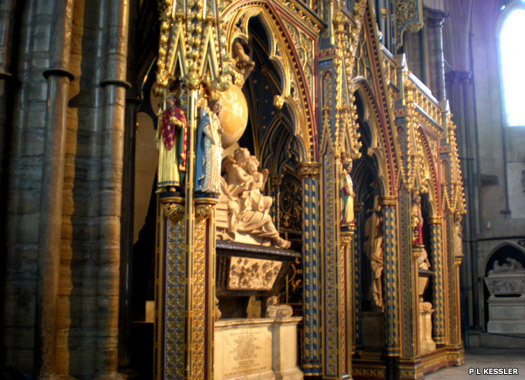 It also served as a suitably regal setting for Henry's own tomb, under the highest Gothic nave in England. The work was largely finished by the architect Henry Yevele in the reign of Richard II. 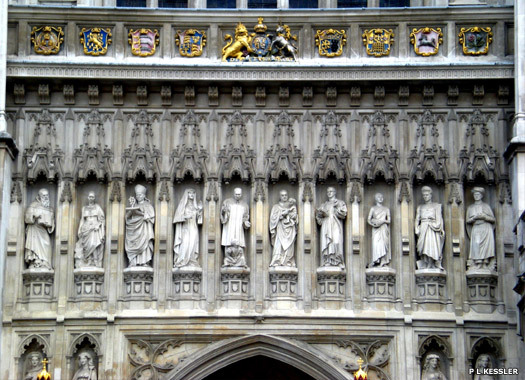 Henry VII added a Perpendicular style chapel dedicated to the Virgin Mary in 1503 (known as the Henry VII Lady Chapel). The abbey was seized by Henry VIII during the dissolution of the monasteries in 1534, and closed in 1540. It became a cathedral until 1550, but its royal connections saved it from the destruction wrought on most other English abbeys. 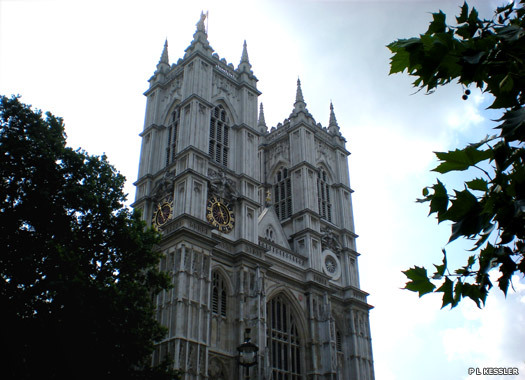 The abbey was restored to the Benedictines under Queen Mary, but they were again ejected under Elizabeth I in 1559. 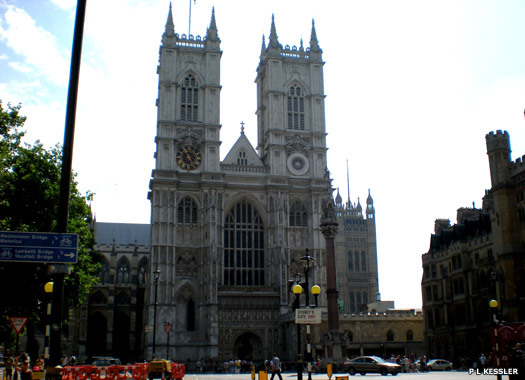 In 1579, Elizabeth re-established Westminster as a 'royal peculiar' - a church responsible directly to the sovereign, rather than to a bishop - and made it the Collegiate Church of St Peter. It was damaged by Puritan iconoclasts during the turbulent 1640s, but was again protected by its close ties to the state during the Commonwealth period. Oliver Cromwell was given an elaborate funeral here in 1658, only to be disinterred in January 1661 and posthumously hanged from a nearby gibbet. Sir Isaac Newton died at Kensington on 20 March 1727 and was buried in the abbey eight days later. His monument, which was the work of sculptor Michael Rysbrack based on a design by the architect William Kent, stands against the quire screen in the nave (shown here) and was completed in 1731. 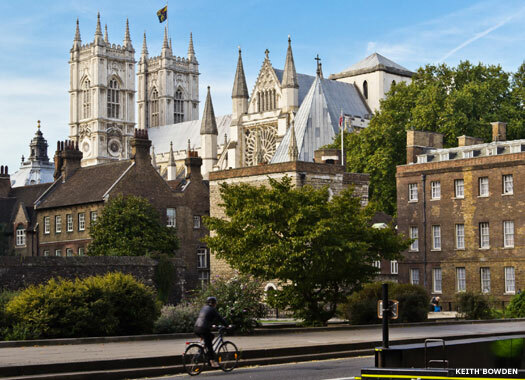 The abbey's two western towers were built between 1722 and 1745 by Sir Christopher Wren and Nicholas Hawksmoor, after they had finished reconstructing half of the City of London's parish churches which had been destroyed by the Great Fire of 1666. 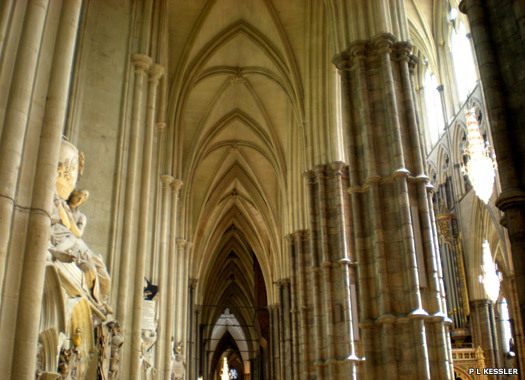 The towers were constructed from Portland stone to an early example of a Gothic Revival design. Further rebuilding and restoration occurred in the nineteenth century under Sir George Gilbert Scott. 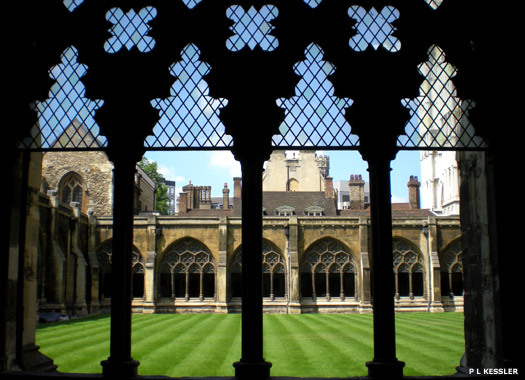 Until the nineteenth century, Westminster was the third seat of learning in England, after Oxford and Cambridge. It was here that the first third of the King James Bible Old Testament and the last half of the New Testament were translated. 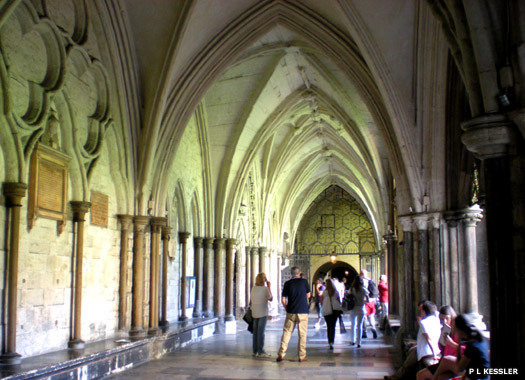 Since the coronation of Harold (II) Godwinson on 7 January 1066, all English monarchs (except Lady Jane Grey, Edward V and Edward VIII, who did not have coronations) have been crowned in the abbey. 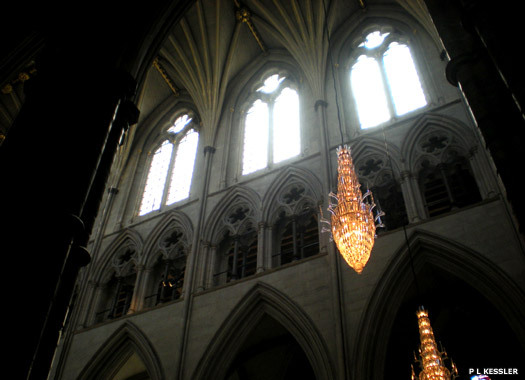 The abbey's organ was built by Harrison & Harrison in 1937, then with four manuals and 84 speaking stops, and was used for the first time at the coronation of King George VI. 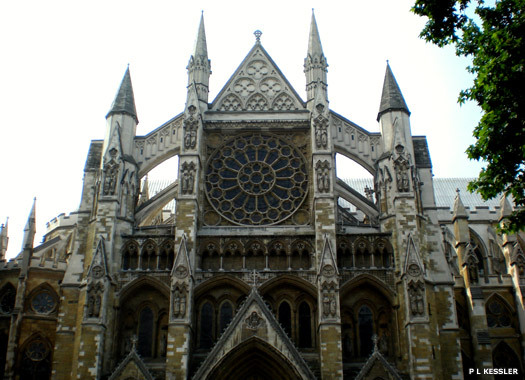 Just three years later, on 15 November 1940, the abbey suffered some Blitz damage, but only of a minor nature. Queen Elizabeth II was crowned here on 2 June 1953, the first such occasion to be fully televised live to the nation and the world.